Dry Skin has less moisture and requires extra care and nourishment to treat marks. A good antimarks cream for dry skin can help you heal marks effectively. Bajaj Nomarks Antimarks product range extracts the power of potent ingredients which help reduce marks from the root of the problem, through an ADVANCED 4 STEP MARK REDUCTION ACTION. Vatada (Almond Oil) has soothing properties that help provide relief to Dry Skin with marks. Kumari (Aloe Vera) helps with facilitating the collagen building in your skin to repair marks. Amalaki (Amla) has powerful antioxidant properties that helps protect the skin with marks. 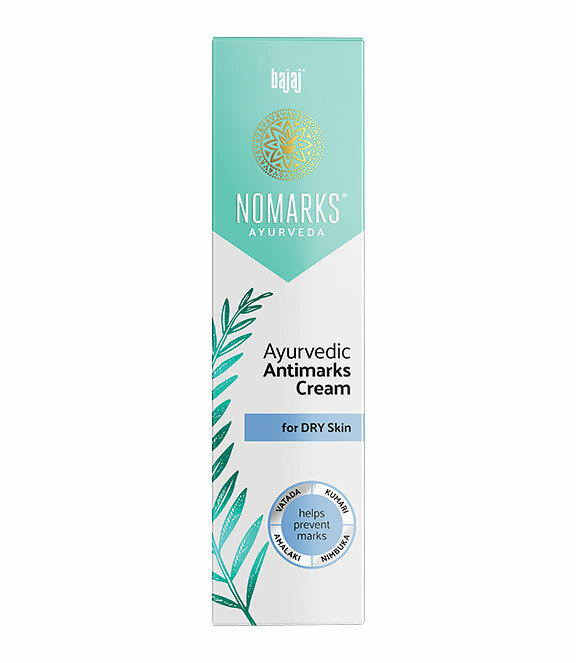 Take sufficient quantity of Bajaj Nomarks Ayurvedic Antimarks Cream for Dry skin. Apply the cream on a clean face and massage gently into the skin until fully absorbed. For best results, use Bajaj Nomarks Ayurvedic Antimarks Facewash for Dry Skin and Cream twice daily. Aloe Vera (Kumari) helps collagen building and repairs marks. Error: Error validating access token: Session has expired on Monday, 11-Mar-19 23:22:46 PDT. The current time is Saturday, 20-Apr-19 15:23:26 PDT.